1/3 cup butter 1/2 " sugar white 1 egg well Beaten 1 teaspoon lemon rind 1 " vanilla 1 1/2 tablespoon maraschino cherry juice. 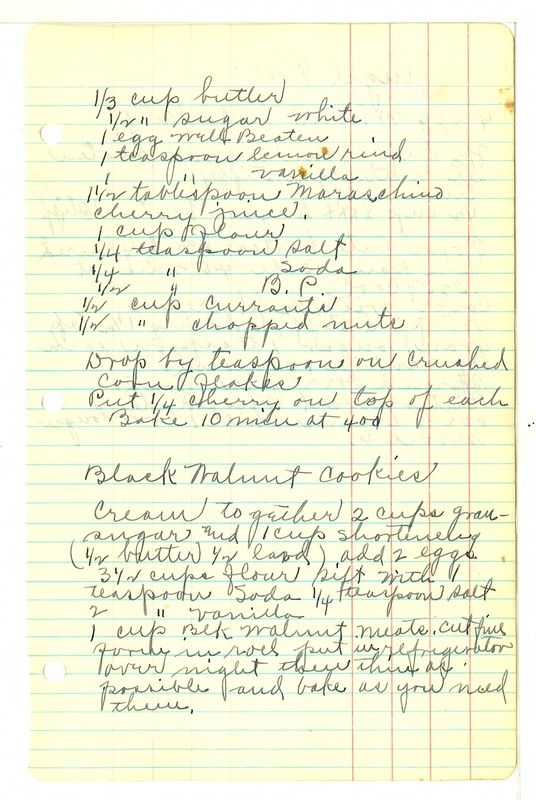 1 cup flour 1/4 teaspoon salt 1/4 " soda 1/2 " B. P. 1/2 cup currants 1/2 " chopped nuts Drop by teaspoon on crushed corn flakes Put 1/4 cherry on top of each Bake 10 minutes at 400 Black Walnut Cookies Cream together 2 cups gran-sugar and 1 cup shortening (1/2 butter 1/2 lard) add 2 eggs 3 1/2 cups flour sift with 1 teaspoon Soda 1/4 teaspoon salt 2 " vanilla 1 cup blk walnut meats. Cut fine form in roll put in refrigerator over night then thin as possible and bake as you need them.